My Mosfilm Collection recommendation for you today is a film by the legendary Elem Klimov, who is most familiar to the Western audiences for his mind-blowing 1985 war movie Come and See. The subject matter of this film, however, would be even more familiar to the Western viewer, as it focuses on probably one of the most well-known Russian historical figures – Grigory Rasputin. Agony (its IMDB page has the wrong picture!) is a film with a very complicated history of production and distribution. The idea of it was conceived in 1966 to mark the 50th anniversary of the Socialist Revolution. The film was meant to be a straightforward piece of Soviet propaganda on the evils of the Tsarist regime based on the play by Aleksey Tolstoy (aka the “comrade count”) with the rather unsubtle title The Empress’ Conspiracy. However the complicated politics of Mosfilm studio led to a change of the assigned director (Anatoly Efros was the initial choice) and Elem Klimov was given the project. 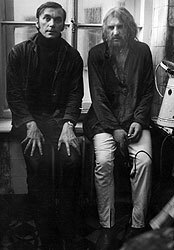 Klimov, being a man of taste, decided that the play was two-dimensional and asked his previous collaborators, Nusinov and Lungin, to write an original script. They did. Klimov liked it and sent it to the State Committe for Cinematography (Goskino) for the approval. Goskino said ‘no’. The script was reworked, rewritten, renamed, forgotten about, then rediscovered, and in 1973 it finally got the approval under the new head of Goskino. Agony was completed two years later, after which it was immediately censored and put on a shelf. Klimov started editing it in 1978 and in 1981 the film was sold to be shown in the West. It received a number of European awards and was finally released in the USSR in 1985 after the beginning of glasnost’. One of the film’s most visible merits is its outstanding ensemble cast, which includes some of the absolute giants of Russian acting: Alisa Freyndlikh (who played the protaginist’s wife in Tarkovsky’s Stalker), Leonid Bronevoy, Anatoly Solonitsyn (another Tarkovsky favourite) and many others. It is a huge cast, at the centre of which is what I believe to be one of the greatest performances in Russian cinema. 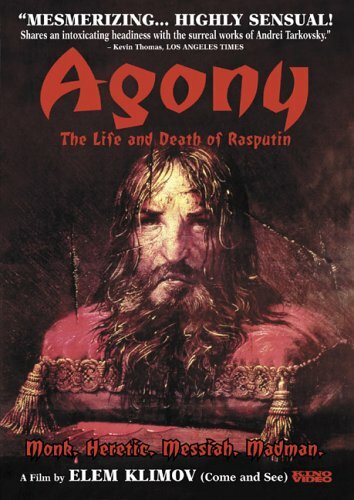 Aleksey Petrenko‘s portrayal of Rasputin is of Day-Lewisesque proportions and intenstity. This performance is an event in itself and should not be missed. Another one of my favourite aspects of the film is its use of the orignal documentary footage from the period, which is mesmirising in itself. But the way Klimov combines it with a fascinating and the effective use of music and the narration by the infinitely charismatic Aleksnadr Kalyagin makes it into something very special. subjective interpretations of Russian history, which makes it all the more interesting to watch and think about. Whether you agree or disagree with the filmmakers’ view of the Tsar and his family, of Rasputin’s murderers Feliks Yusupov and Vladimir Purishkevich (superbly portrayed by two young and relatively unknown actors), and of Rasputin himself; whether you want to focus on the historical inaccuracies or not, you can’t help but give the film credit for masterfully conveying the overall atmosphere of the period. The sense of illness, depression, and even a kind of rot in the air permeates the film, which makes for a very impressive cinematic achievement, and watching it is a true experience. Watch Agony Part 1 and Part 2 with English subtitles, courtesy of Mosfilm Youtube Channel.